Coppell ISD has one of the lowest allocations to instruction per student among North Texas high-achieving districts and it’s affecting our students’ performance. The ACT is a measurement of school curriculum-based skills. Rather than focusing on problem solving ability like the SAT, the ACT focuses on English, Math, Reading, and Science knowledge. Since 2013, Coppell ISD’s tax collection per student has grown by 32%, while instruction allocation has remained nearly stagnant at a mere 7%. Were Coppell ISD to emphasize instruction like neighboring Carroll ISD, $4,263,603 more dollars would go directly to education through teacher salaries. Data for instruction expenses per student can be found on the TEA Website. ACT scores can also be found on the TEA Website. Article 7 of the Texas Constitution calls for a “free” and “efficient” public education system. Coppell ISD has not adopted an operations tax rate lower than the legal maximum of $1.17/$100 of property value since 2011 despite significant appraisal value growth. 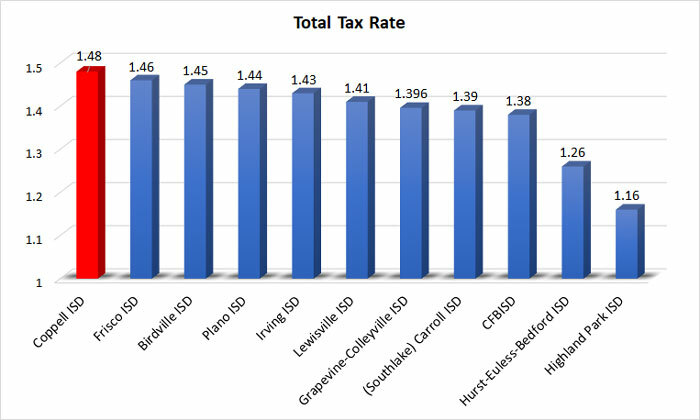 Coppell ISD currently holds one of the highest tax rates in North Texas. Highland Park ISD, Carroll ISD (Southlake), Plano ISD and Grapevine-Colleyville ISD all have 3 things in common. Their total tax rates are all lower than Coppell ISD’s, their instruction allocation per student are all greater than Coppell ISD’s and their average ACT scores are all higher than Coppell ISD’s. 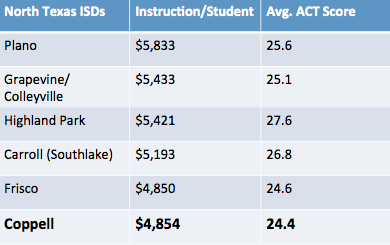 In essence, Coppell ISD takes more and produces less than other high-achieving North Texas School Districts. In this day and age, children must face threats at school like never before.